Merry Christmas and a vibrant Happy New Year everybody! 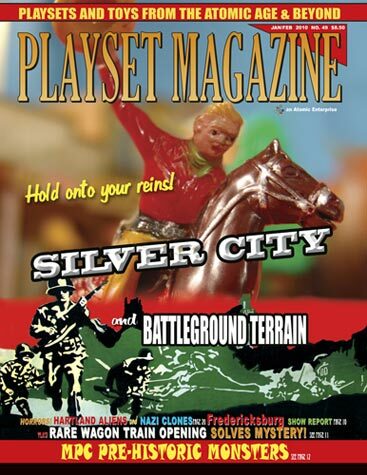 As Doc Holiday says in Tombstone, “Wyatt, you are an Oak!” He meant Wyatt was full of surprises and stronger than ever – and we hope you'll feel that way as Playset Magazine begins its eighth year publishing America’s best – not to mention only – magazine devoted entirely to plastics, toys, and playsets of the Atomic Age and Beyond. We’re sort of the last man standing, but we stand strong with you. This issue we have so many surprises and never – before covered gems we have to call it a flagship issue of the efforts of many contributors. MPC Dinosaur history with the “Pre-Historic Monsters” by Jim McGough which really takes you back to the early 1960s as Jim’s rare, rare, rare original catalog pages show us the sets and contents of these colorful little beasts. 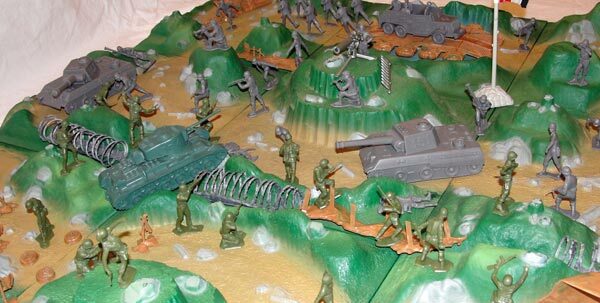 Battleground Terrain, rarest military set of the 1960’s has six hard plastic terrain sections that connect together with roads and hills -- a playmat on steroids – plus a battalion of Germans and GI’s, tanks and artillery that comes to us through the efforts of Rick Eber complete with a mighty fine diorama. For reviews, Hobby Bunker has been unusually busy churning out a steady stream of some useful and obscure vintage molds. Plus Tom Stark takes us on a tour with a tip of the hat to HaT, plus more plastics that you can find locally right in your hometown hobby store. There are plenty more rarities and the unusual to entertain you with Hartlands Horrible Aliens by Mark Young, and Nazi Clones. There’s news, ads, “housekeeping” reports, and lots of fresh classifieds too. That is quite the list of rarities for one issue, don’t you think? And lots of excitement, too. So whether it’s monsters, dinosaurs, the Wild West or a battleground on a distant soil, its all here for you this issue. Folks, a special thank you to all of you who have supported this effort. We promise you we will try harder than ever to bring you more good clean excitement and rarities than ever before this year as we continue our journey together back in time, resting in the warmth and brilliant glow of delicious memories and childhood toys that prove being a kid really wasn’t a brief passing moment, but a way of thinking and for some of us lucky enough, a way of life. And to top it off, we are strong too. Like an oak. 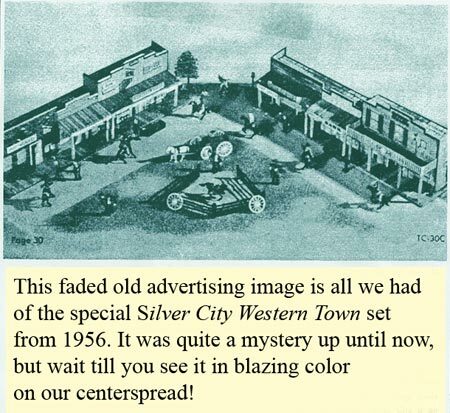 With the fall of so many other publications, we have found in brothers in friendly related magazines – Plastic Warrior in Merry Old England and the grand Old Toy Soldier Newsletter, chronicling the rise and fall of metals here in the states and internationally. We wish them both continued great success and healthy publishing.